When I heard that the new Grand Hyatt Resort in Playa del Carmen was awarded with the AAA Four Diamond Award after operating for only eight months (! ), I was intrigued. If a hotel receives this honor after such a short time, it had to be exceptional. The other aspect of the Grand Hyatt that piqued my interest was the fact that it was designed by the acclaimed Mexican architect Sordo Madaleno, and the award-winning New York-based Rockwell Group. I knew I had to check this new resort out for myself during my recent road trip across the Yucatan Peninsula. 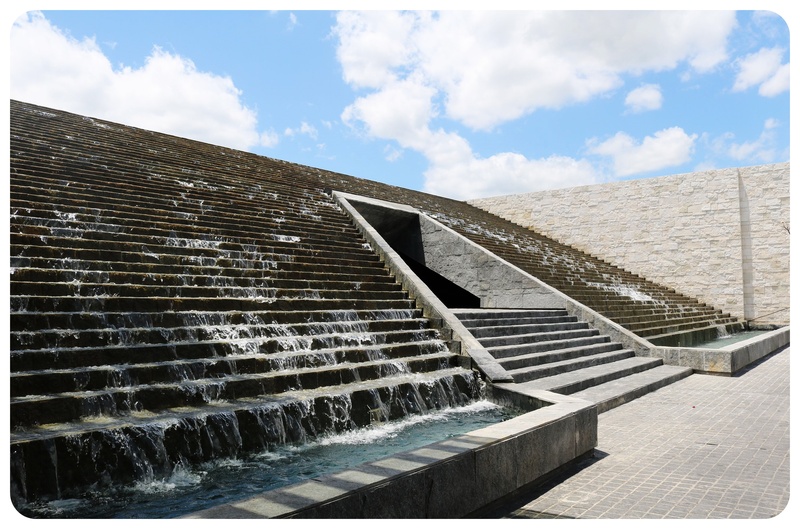 Even just my arrival at the hotel was an impressive experience: We drove up a spacious driveway and at the end of it, we were greeted by a massive fountain, which resembles a Mayan step pyramid. 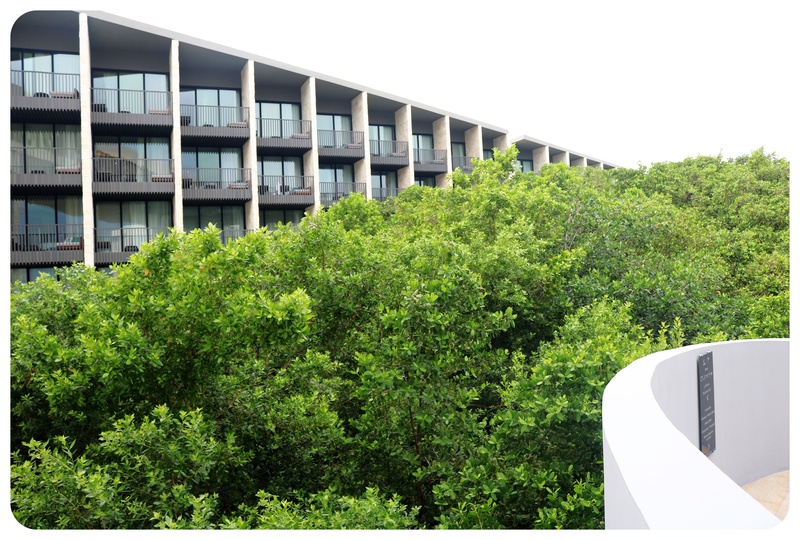 The intention to incorporate the local culture and natural beauty of the area was apparent not only at the entrance, but throughout the entire property – when you access the grand entrance area you immediately see the vast mangrove gardens, which were preserved in the process of building the hotel. 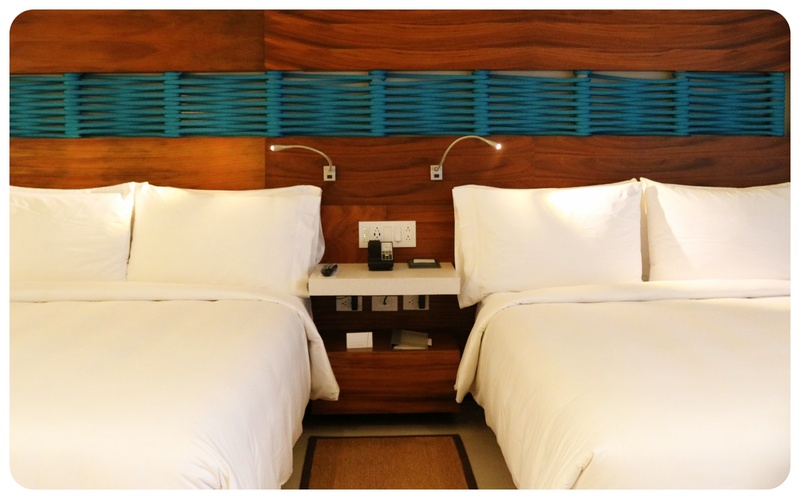 The rooms are set in U-shaped four-story blocks that surround the center section of the hotel. 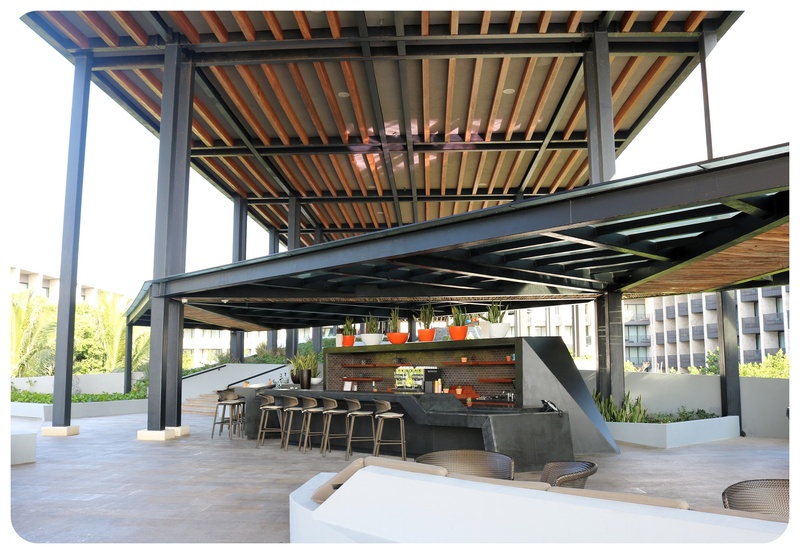 The wide open central section was designed in a way that offers terrific sea views, and can best be described as a covered walkway (Paseo) where you find the reception, a concierge desk, a coffee shop and a couple of snack bars. While the receptionist was checking us in, we were handed two ice cold glasses of champagne – the perfect way to start off our time in such breathtaking surroundings and to relax us after the long day of travel (which involved a flight from New York and the drive to Playa del Carmen from the airport in Cancun ). We loaded our bags onto a luggage cart and a porter took them up to our room, leaving us free to continue sipping our champagne. Walking through the long, open corridors on which the rooms are located, we noticed right away the finishes and materials that were thoughtfully sought out for the property: wood, sand colored stone and lots of plants on the open side, always emphasizing the connection with the natural environment. And then there is the tasteful artwork – I don’t think I have ever been to a hotel with so many carefully selected pieces of art, featuring materials such as wood and metal. 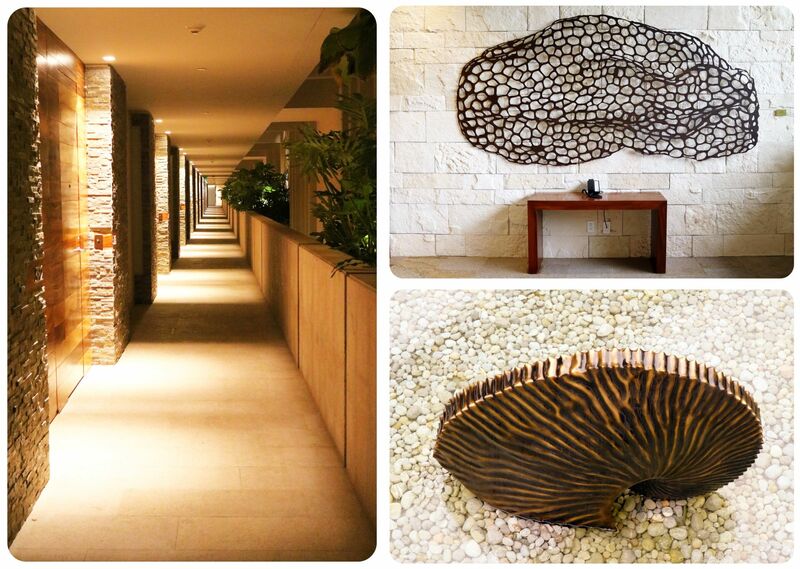 Much of the artwork was created by the artist César López-Negrete, who conceptualized many of his pieces exclusively for the Grand Hyatt. I found myself constantly impressed with the design of the hotel, especially in the mornings, when I walked down to the Paseo. I was stunned by the grand architecture every time. When we were shown our room, I felt immediately at home: it was elegant and spacious, with contemporary furniture, sun loungers on the balcony, and a bed that looked so comfortable that I knew right away I’d be able to get a decent night’s sleep. There are 14 different room categories at the Grand Hyatt, ranging from regular ocean view rooms to more luxurious swim-up rooms which have access to a private pool (which is shared with the other swim-up rooms). The rooms with the most stunning vistas are without a doubt the executive suites, which are located on the fifth floor of a bridge that looks right over the translucent waters of the Caribbean sea. 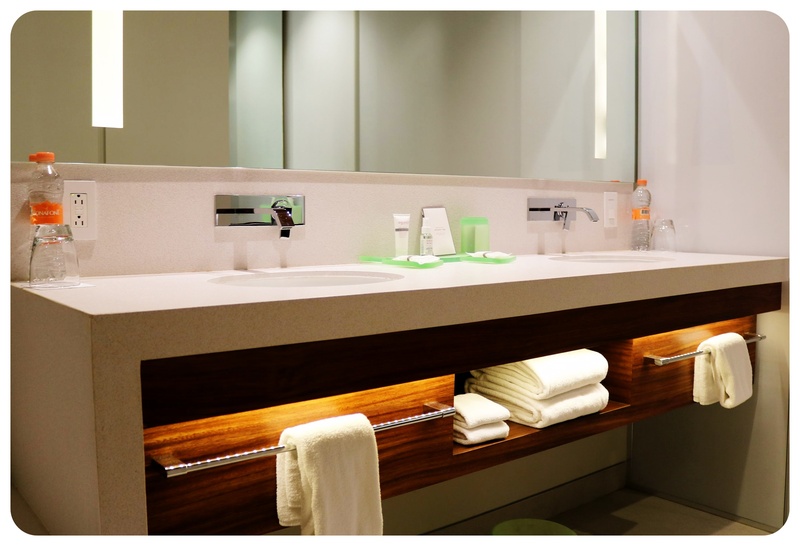 All of the rooms are big enough to feature their own dining area, and come with flat screen TVs, iPod docking areas, coffee machines, and a bathroom that is half open to the room and features large double sinks. I loved the modern yet timeless interior design with a touch of nature thanks to the wooden features that were incorporated. A fantastic extra? 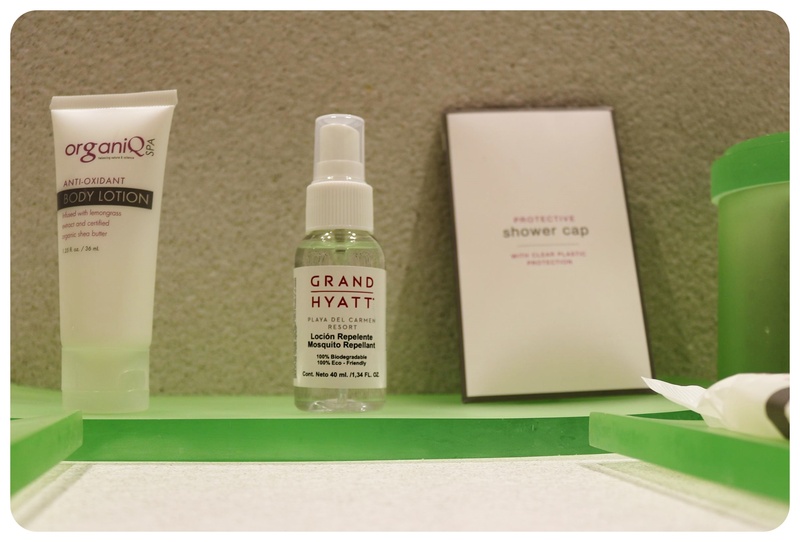 The mosquito spray that was included in the toiletries (which are organic) since the mosquitos can get annoying, especially after a rainstorm or at dusk and I truly appreciated the hotel’s thoughtful gesture. Sometimes it’s little things like this that can make a huge difference. Despite the rooms being so gorgeous, the only time I ended up spending in my room was when I was sleeping, because the real showstopper at the property are the three infinity pools (the Cenote Spa would be a very close second, but more on that later.) I was tempted to extend my stay as soon as I saw the beautifully designed swimming pools and sun loungers, some of which were conveniently placed right in the water. 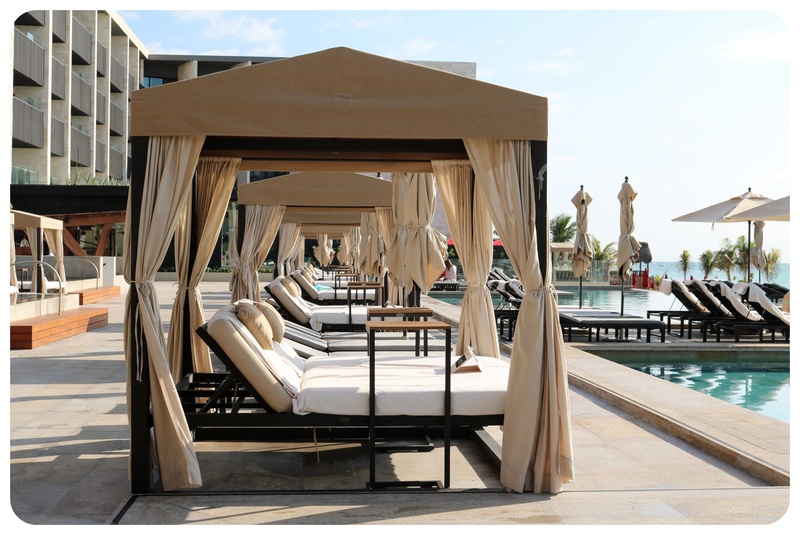 But I also loved the bigger ‘nests’, which almost felt as if somebody had taken a super comfy canopy bed and placed it by the pool – I didn’t want to leave mine! And the best bit: you don’t really have to. 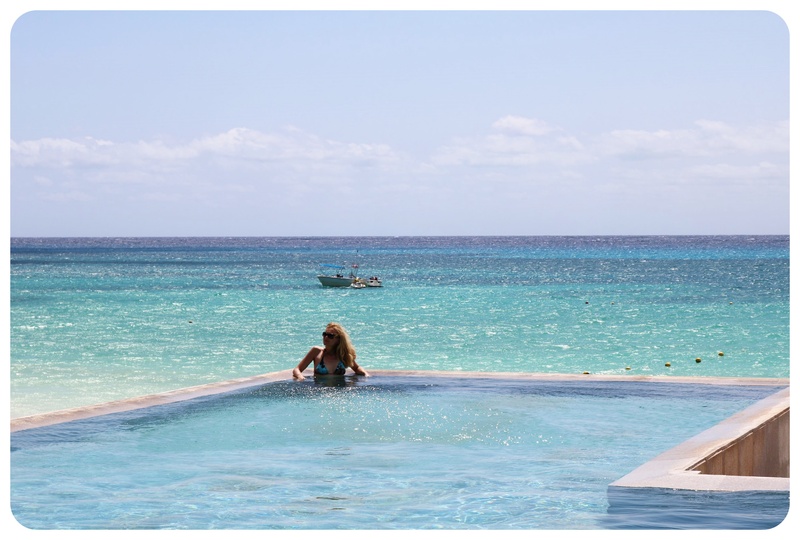 The attentive wait staff serve food and refreshments right to the sun loungers, so the only thing you need to do is to get up from time to time to enjoy the views from the infinity pool during a quick dip in the water. 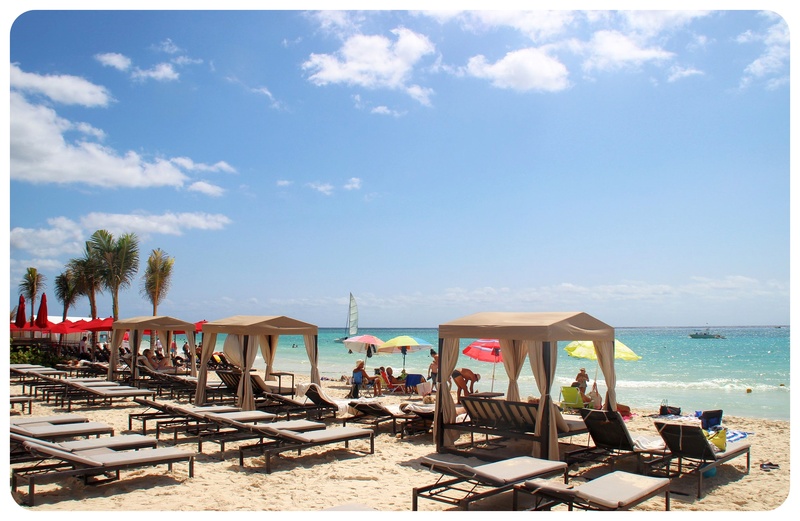 Guests who prefer the actual beach can lay down on sun beds in the sand, right by the turquoise Caribbean waters Playa is famous for. The Grand Hyatt has a 460 feet /140 meter beachfront, but it doesn’t really matter if you lay out on the beach or in the pool area, because they’re just steps away from one another. 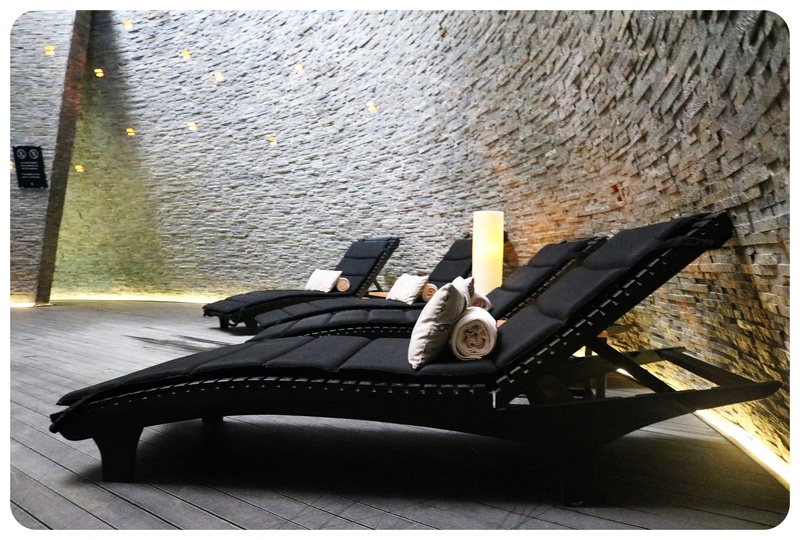 If laying by the pool is not relaxing enough for you, head straight to the Cenote Spa. I’ve seen quite a few spas and wellness centers in my life, but I don’t think I’ve ever been as impressed with one as I was with the enormous 6,000ft Cenote Spa. My first thought on a stroll through the spa was that the spa alone should win a prize for its architecture and interior design, and funnily enough I later learned that the spa did in fact win the Interior Design Best Project Of 2015 award. 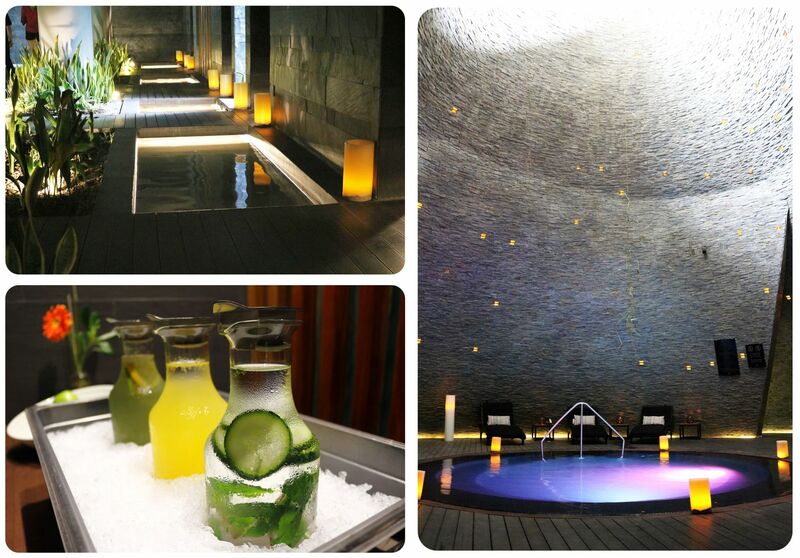 That’s how stunning the Cenote Spa is – I am afraid the photos can’t even do it justice. The centerpiece of the spa resembles a cenote, a natural underground swimming hole that are unique to the Yucatan peninsula . Inside the igloo-shaped cenote there is a circular pool, which is extraordinary. This place is in fact so breathtaking that couples can book romantic dinners for which tables are set up right by the cenote pool, lit by intimate lights – a wonderful spot for a dinner for two. 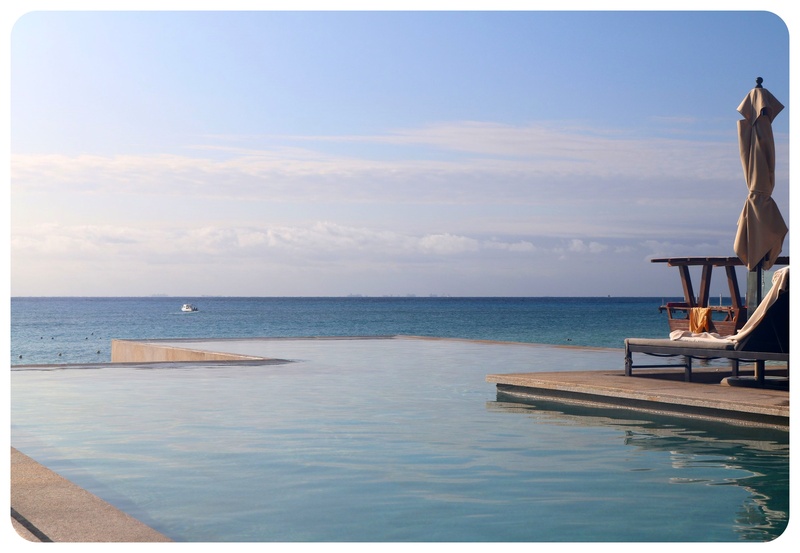 It is also a fantastic spot for morning yoga, and luckily for yoga enthusiasts , that is exactly what you can do there. 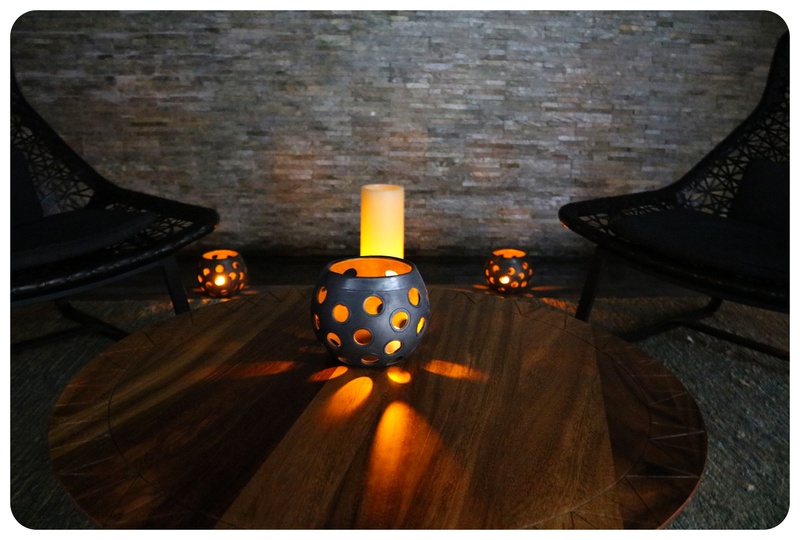 The spa treatments are designed with the Mexican culture in mind too, with unique treatments such as the Mayan head massage with cocoa and tequila oils. 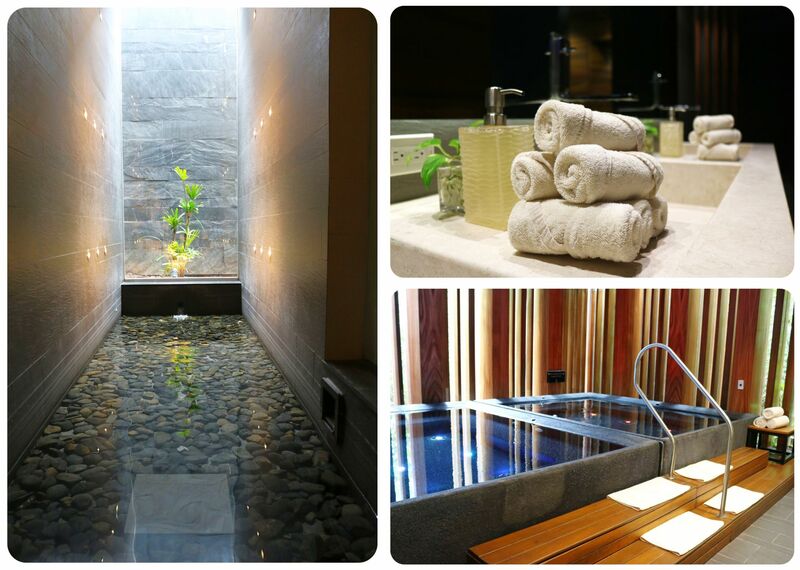 In addition, the Cenote Spa is equipped with a steam room, sauna, cold plunge pools, a Jacuzzi and a lap pool. 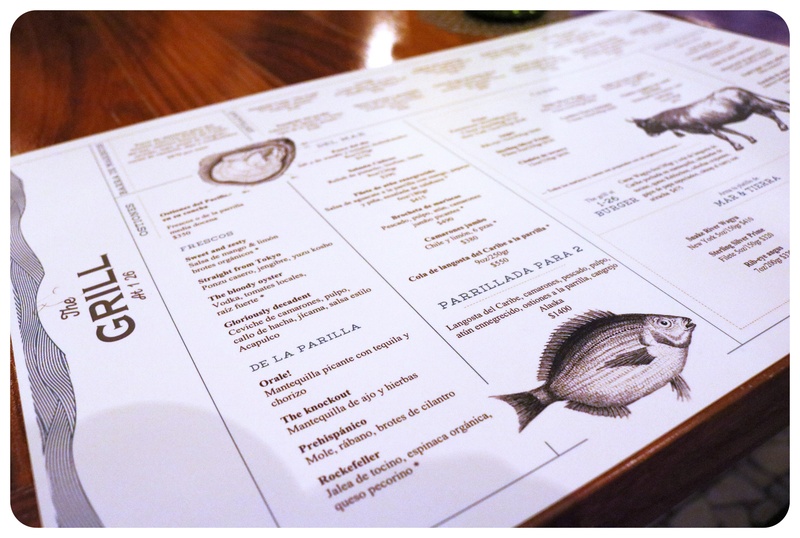 There are three restaurants at the Grand Hyatt – La Cocina, The Grill at 1 26 (referring to the cross streets the hotel is located at – 1 Avenida and 26 Street), and the Raw Seafood Bar. In addition, there is a coffee bar, El Paseo, conveniently located in the covered walkway area. 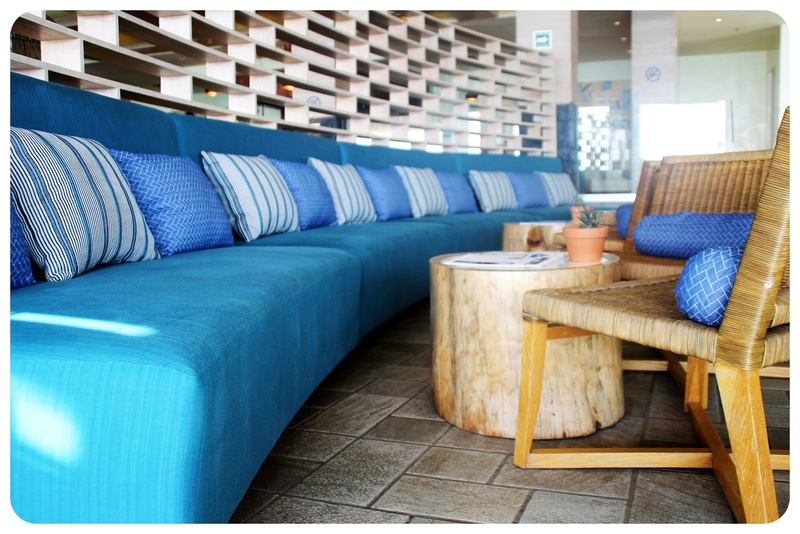 Both La Cocina and The Grill at 1 26 have amazing sea views, bordering the pool area, while the Raw Seafood Bar is located in the center building with a more casual flair. 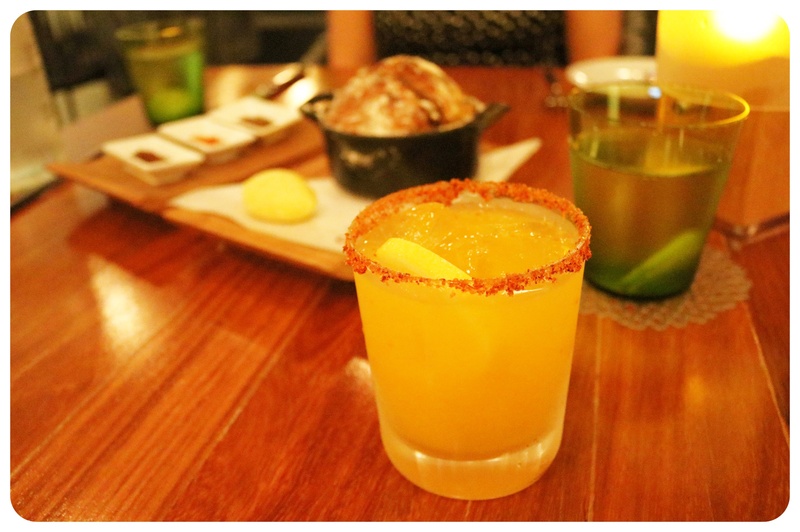 I had dinner at The Grill at 1 26, where you can get some of the best steak and grilled seafood in Playa del Carmen. My travel companion was excited to try a good steak, and I have to admit that I was a bit worried that I wouldn’t find something vegetarian on the menu, but there was nothing to worry about: the restaurant has a special vegetarian menu! 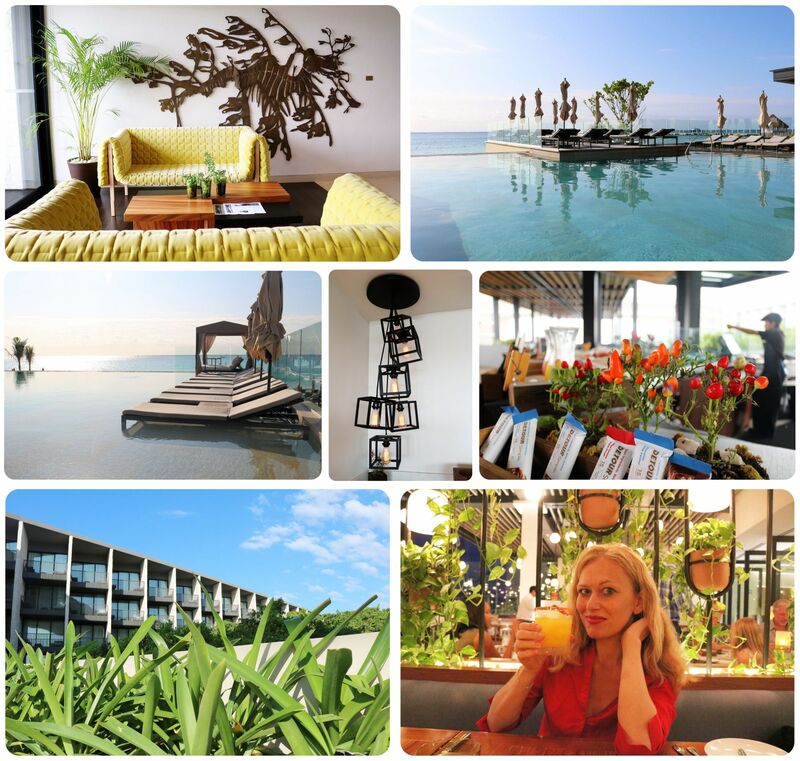 Sadly, I didn’t get to dine at La Cocina, which offers international food and focuses on fresh, local ingredients, but I got to experience the restaurant during breakfast and loved the atmosphere inside as well as out on the terrace, overlooking the beach. 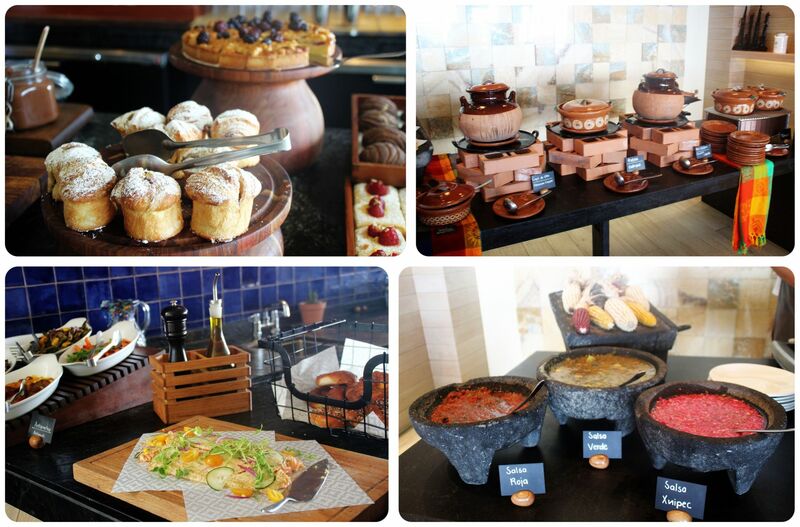 The breakfast buffet was one of the best I have experienced in any hotel, with an extensive selection of European, North American and Mexican dishes. Every single dish I tried was scrumptious, and I couldn’t resist sampling pretty much every single pastry that was on the buffet, simply because they looked so mouthwatering good. And let me tell you: they are worth every single calorie. 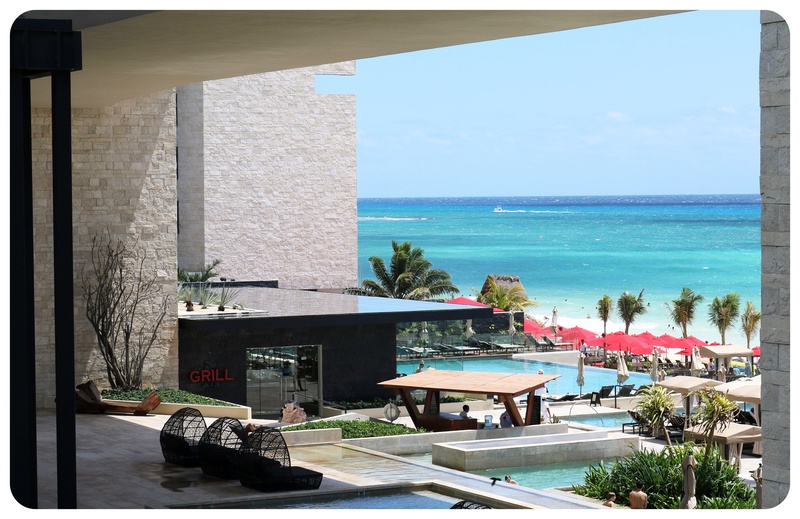 One thing I appreciated about the Grand Hyatt was the fact that the hotel is not, like most resorts of a similar size in Playa del Carmen, an all-inclusive resort, but encourages guests to also go out and sample the many nearby restaurants on 5th Avenue. 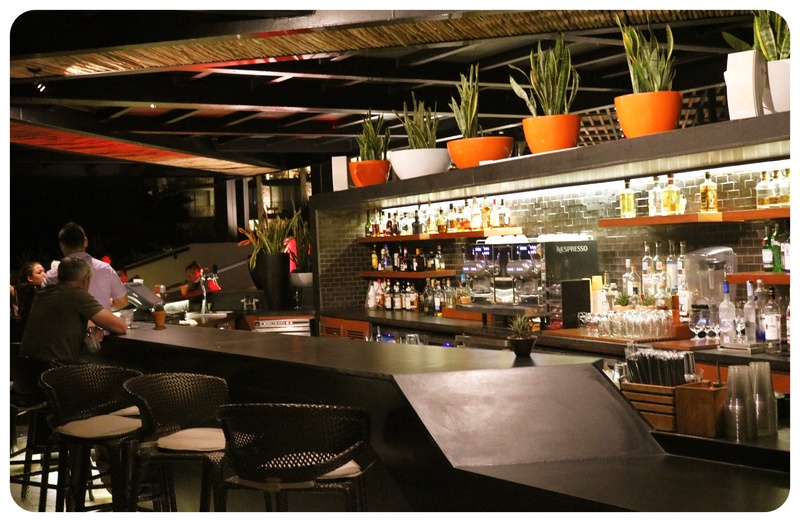 If you do prefer to eat at the hotel however, you can add on a meal plan to your room – just dinner (US$40, at La Cocina or The Grill); dinner and lunch (US$59) or breakfast, lunch and dinner (US$74). Along with everything I have mentioned above, there is also a coffee shop onsite, so there is really no reason to leave the hotel. 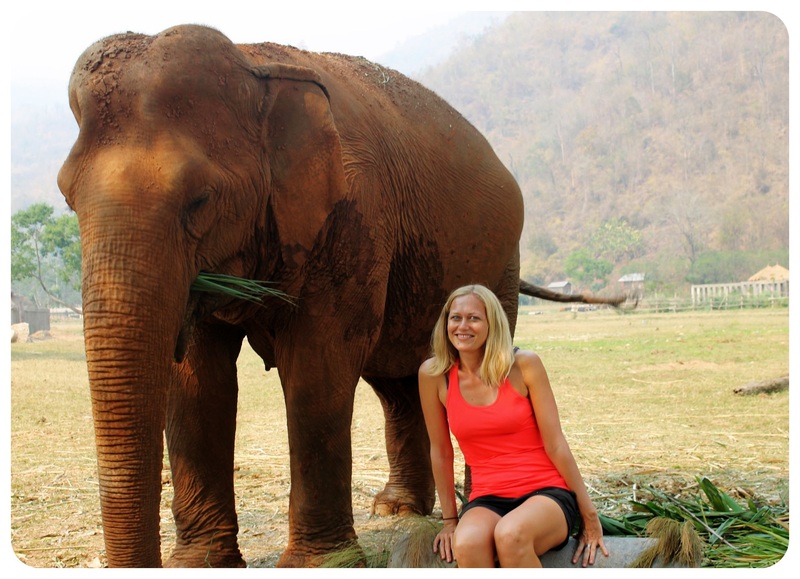 And if you are afraid you might get bored: fear not, there is so much to do at the resort, it is impossible to experience even the slightest hint of boredom. Not only is there a movie theater (including a popcorn machine for an endless flow of fresh popcorn! ), but there is an entire room dedicated to entertainment. 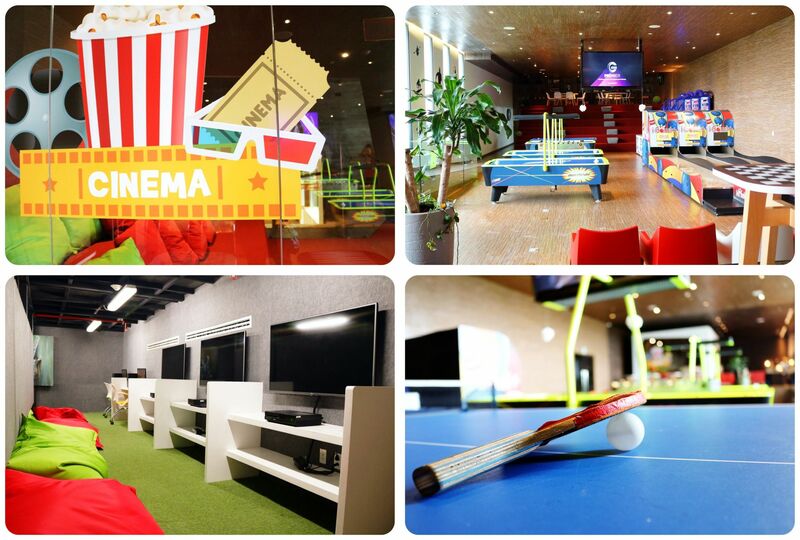 A ping pong table, gaming consoles, table soccer, board games.. you name it, they have it. 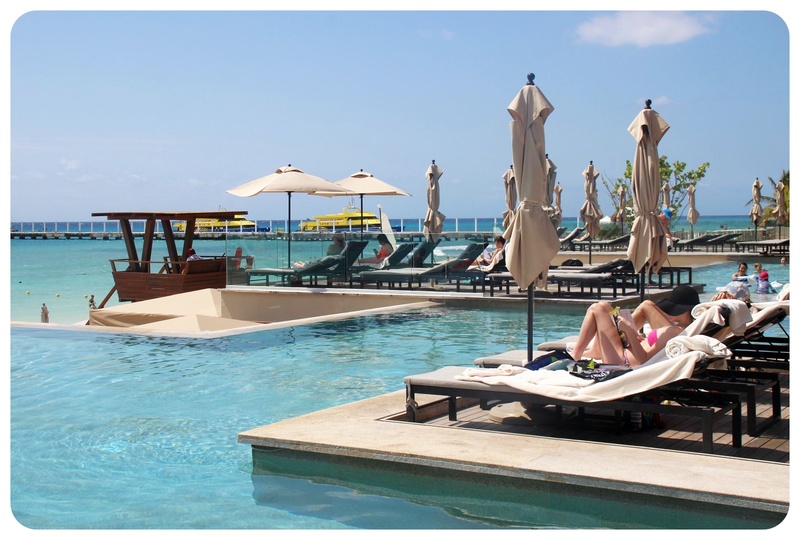 That would be where I’d be hanging out if I found myself in the Grand Hyatt during the rainy season (that said, I’ve never experienced a lot of rain in Playa, even when I was there during the rainy season… after a shower, the sun usually comes out again quickly). This room is named ‘Teen Arcade’ but judging by my own excitement over this room, I am sure that adults enjoy it just as much. For families traveling with kids, there is a great kids room with plenty of toys – I know that my nieces and nephew would love it there – and experienced staff, so you can also enjoy some kids-free time during your vacation. There is even a children’s dinner on two nights, so that parents can enjoy a romantic dinner for two during their vacation! If you are looking to get married, the Grand Hyatt Resort can arrange your dream destination wedding right on the beach, and with 314 guest rooms and suites, you can rest assured that all wedding guests can be accommodated. Another huge plus factor of the hotel? Its location! 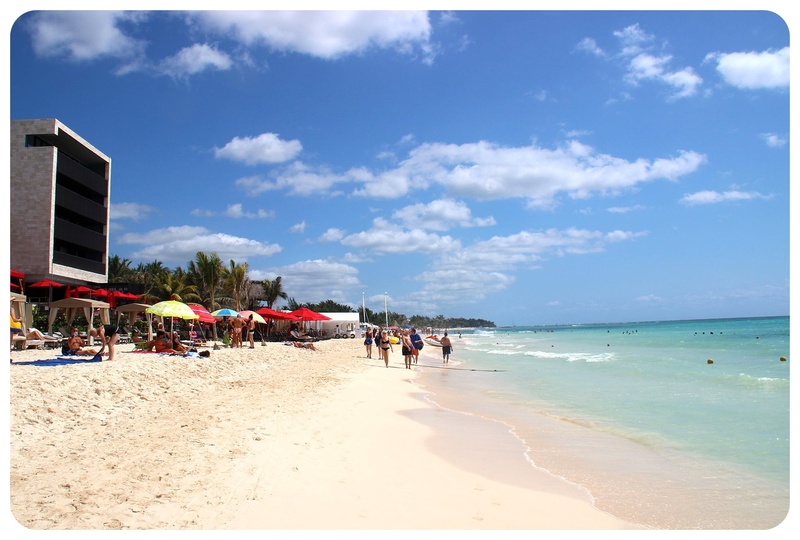 Playa del Carmen’s main shopping and entertainment drag, Fifth Avenue (Quinta Avenida), is just two minutes away. 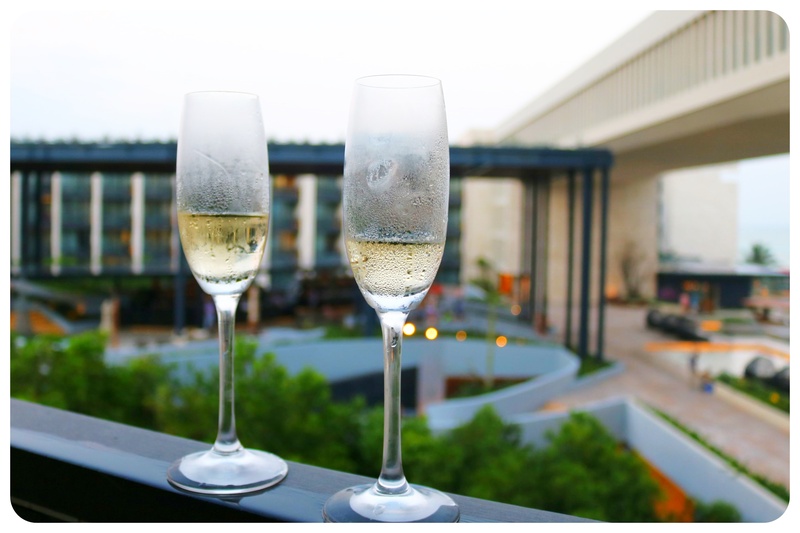 Right away you’ll find yourself in the middle of shops, bars and restaurants, and the new Quinta Alegria Shopping Mall is only a five minute walk from the hotel. 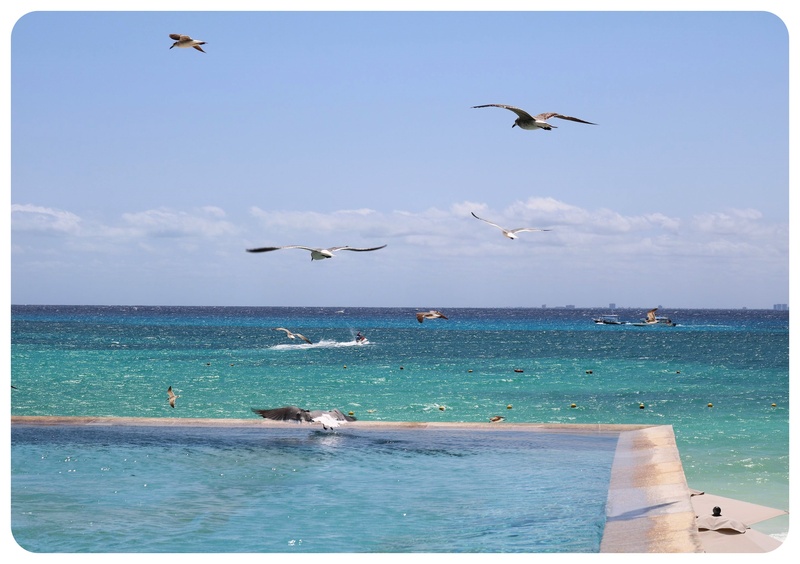 Most of the hotel resorts in Playa del Carmen aren’t actually in town, but stretch along the beaches north and south of the center, which means you have to take a taxi every time you want to go into town. I really appreciated that at the Grand Hyatt, you can just walk out of the hotel and are in the middle of it all. And the beach where the hotel is located, Mamita’s Beach, is one of the best beaches in Playa. So what’s my verdict? 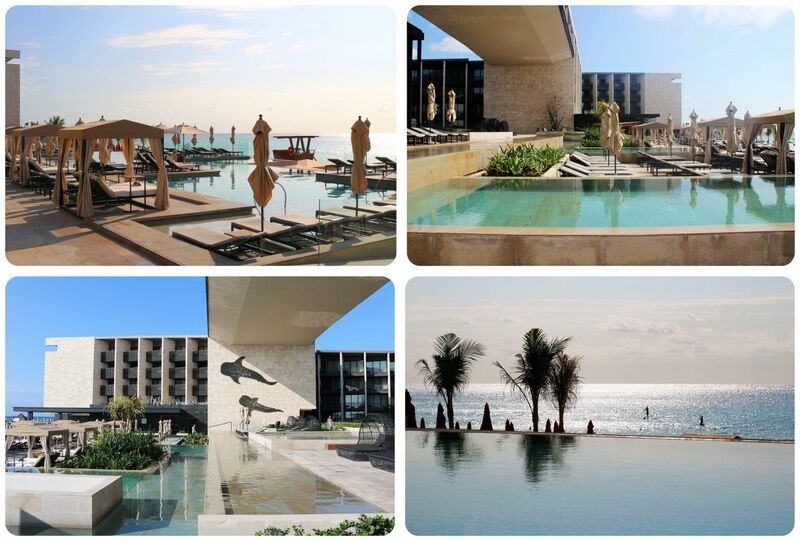 The Grand Hyatt Playa Del Carmen gets five Globetrottergirls gold stars! I was trying hard to find something to complain about, or room for improvement, but I honestly couldn’t find anything. 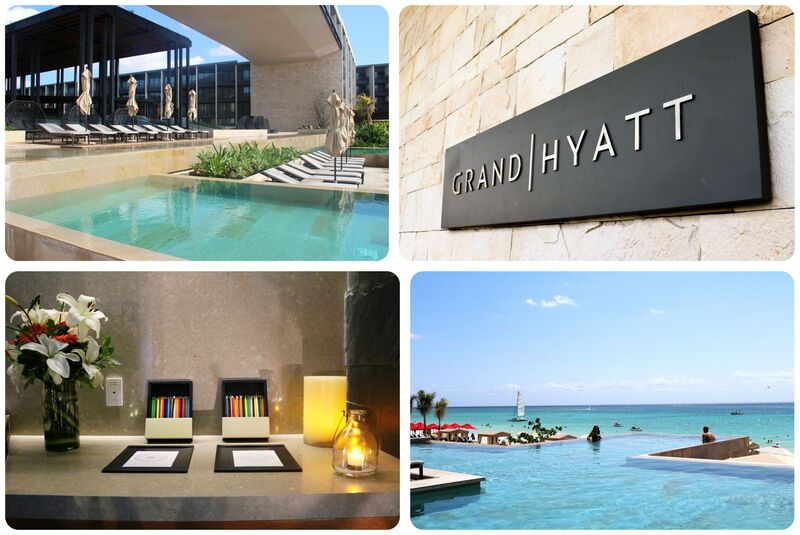 A stylish, elegant hotel with a gorgeous pool area and stunning spa, comfortable rooms, sophisticated restaurants and attentive staff – it’s impossible to leave the Grand Hyatt and not feel refreshed and relaxed, no matter if you’re there for a quick weekend getaway or a week-long holiday. I am already dreaming of a return to this incredible hotel. A Canada road trip, a guidebook giveaway and the chance to win a free hotel stay (up to $250 value)!